Xtra Whey amino acid profile (per 100g of protein). I couldn't find any amino acid information for Xtra Whey. [XL Nutrition] Xtra Whey review. Summary: Xtra Whey is a cheap whey protein that underperforms. It's also full of sugar. If you want lots of protein at a low price, get Impact Whey instead – it comes in a sack too. Xtra Whey is obviously aiming to be a cheap and cheerful whey protein supplement that doesn't do anything fancy, but gets the job done at a low price. Unfortunately however for XL Nutrition, it falls short of the top spot in this area thanks to the impressive Impact Whey Protein from MyProtein. Impact Whey Protein is higher quality, better tasting and better value for money than XL Nutrition's Xtra Whey. Impact Whey just blows it out of the shaker and beats it in every aspect worth comparing. So even though it comes in a manly sack and looks like an excellent deal at first, when you work out the cost per serving of protein you'll find that there are more cost-effective (and flat-out better) whey supplements out there. Xtra Whey is a straightforward WPC supplement, which is the cheapest and most basic form of whey protein. So from the outset you can expect it to have a few more carbs and fats than more advanced whey blends like Reflex Instant Whey (containing WPI and WPH), but that's not necessarily a bad thing if you're happy with getting a WPC powder on its own. 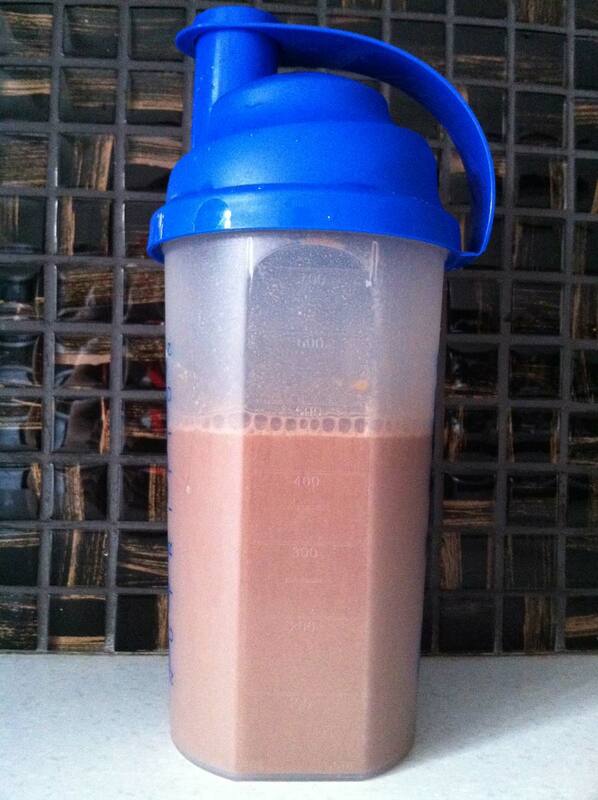 However, compared to a good WPC supplement like Impact Whey it has far less protein/100g and a lot more sugar/100g. Values are per 100g of powder. Look at all that sugar. I don't feel comfortable having that much sugar in my whey protein shakes, especially considering other comparable supplements don't have nearly as much sugar as that. It just seems like a poor effort at the end of the day. Whilst Xtra Whey isn't the worst whey supplement for sugar (see Ultimate Whey for more information on that), it could do better nutritionally – a lot better. It's bland and pastey. I don't drink muddy water, but if I did I bet it would taste (and look) a lot like the chocolate flavour of Xtra Whey. If you've been unfortunate enough to buy a bag of Optimum Health's Ultimate Whey, you'll find Xtra Whey tastes like the less-sweet version of that. There's no power or effort in the flavour – it just seems as though XL Nutrition have given the whey powder just enough flavour and enough colour to not make it look or taste too unpleasant. You're not going to look forward to a shake of Xtra Whey, but on the bright side you're not going to fear it either. And that's just about the best thing I have to say about the taste. Xtra Whey Mixability: 50g of powder + 400ml of water. Xtra Whey mixes wonderfully, which is both surprising and annoying. It's surprising because the powder itself is horribly stick and clumpy. Powders like this never mix well, but this one is flawless. It's annoying because it gives a poor protein supplement a better score than it deserves. The mixability itself is impeccable. It's equally as good as top quality powders like ON's Gold Standard Whey and Dymatize's Elite Whey. The consistency is smooth and there's no frothing. Mixing and drinking it is a pleasure (aside from the taste of course). However, the praises similarities end with the powder itself. It's clumpy and sticky. With a little bit of effort you could build a sand castle out of the stuff with your bare hands. To make things worse Xtra Whey only comes in a bag, so when you're digging around in the powder with the scoop your hand and arm is going to get absolutely covered. If you're a clean freak you're going to be nervous each time you make a shake. 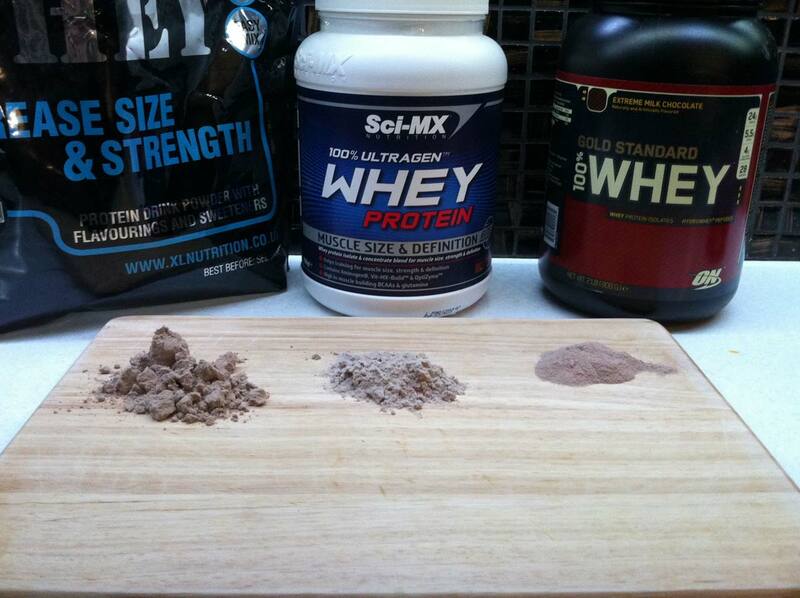 Xtra Whey (left) is clearly clumpier than Sci-Mx Whey (middle) and ON Gold Standard Whey (right). 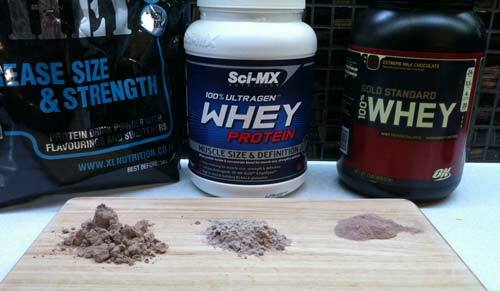 The mixability is the best aspect of what's an otherwise sub standard whey protein supplement. This great mixability is completely wasted on a product that's not worth buying.